During the night I awoke several times to hear thunder off in the distance. When we crawled out of our tents in the morning, it looked like we were going to get wet for sure. To try to avoid having to carry wet tents today, we all packed quickly and headed for the convenience store down the hill to see what we could scrounge for breakfast. While Freda gorged herself on a cold can of beans and franks (yummy! ), and Rick downed his first Coke of the day, I settled for a more traditional breakfast of chocolate covered donuts and coffee. I don't remember what Rich had, but I'm sure he had plenty of it! 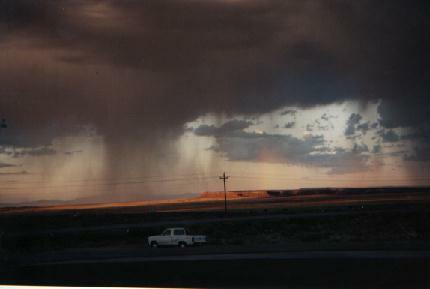 While we ate our breakfast in comfort inside the convenience store, we watched a thunderstorm move across the plain outside the window. 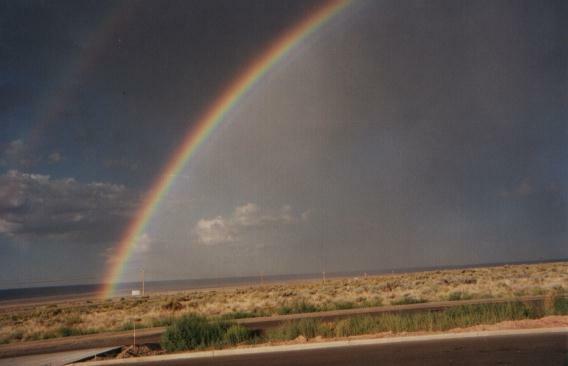 As the storm passed, we were treated to something I had never seen before; a full double rainbow arch. The picture here is but a pale and pitiful representation of the real thing. After breakfast Freda decided to get a head start on the day's ride, and she took off towards Fredonia. Rick, Rich, and I spent some time touring Pipe Springs National Monument before heading for Fredonia in hopes of finding a diner where we could stoke up with a proper breakfast and plenty of coffee. Being the pathetic coffee-addict that I am, I felt compelled to time-trial to Fredonia. My efforts were rewarded with an excellent breakfast at Nedra's Cafe in the center of town. Just as I was finishing up my first cup of coffee, Rich and Rick rolled in. After we finished breakfast we rolled out of town along Rt. 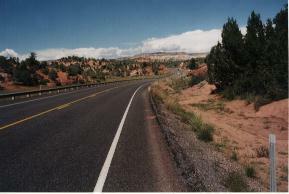 89, heading for the Utah border and the town of Kanab. This stretch of road has little to recommend it. Fredonia is a fairly ugly town, and the stretch of countryside heading to Kanab is pretty plain and heavily disturbed by 'development'. Figuring that Kanab would be our last chance to shop today, we stopped at the local supermarket. I asked Rick if we should get another cantaloupe, since the one we had devoured the previous night was mighty delicious. "Well" Rick replied, "if you want to carry it." So, with a cantaloupe and other delicacies crammed into my panniers, and a large carton of chocolate milk sloshing around in my stomach, we were back on the road. Little did I know that as soon as we were out of town the road would start climbing. And climbing. And climbing some more. We continued out of Kanab and towards the top of the pass, where the turn-off for Coral Pink Sand Dunes is located. The road was challenging, but also rewarding. The scenery was lovely. It is incredible to me how the vegetation changes so dramatically in a few short miles. Elevation seems to be everything in this environment. As I climbed higher I watched the trees change to shrubs, then the shrubs become shorter and sparser. Finally, the long, slow, hot climb ended. After coasting a short way down the western slope I was at the turn off that would lead me to Coral Pink Sand Dunes State Park. By this time I was pretty well fried. While the road and the country-side were lovely, my legs were just too shot to enjoy it much. It was disappointing to find that most of this final ten miles would be a slow inexorable uphill grind Fortunately, the park proved to be well worth the effort. The sand dunes themselves are, of course, spectacular. The state park campground also proved to be lovely. We were also well-entertained by watching the behemoth RV's come into the park towing mini-garages behind with their ATV's inside. I know people who live in houses smaller than some of these rigs! For a while there was an actual traffic-jam on the campground road as one of these RV's tried to maneuver onto it's campsite.